I usually wait until I’ve put at least 50-100 miles on a shoe before I write a review post detailing my experience. My opinions on the La Sportiva Mutant can’t wait that long, and I wanted to do a shoe preview now, with a longer more detailed review coming in 100 miles. Simply put, I love these shoes! I took them for a 13 mile test hike this Sunday that climbed 3500 feet over fire roads, single track, shale, snow, and ice…and they ate it all up. Anyone who reads this blog knows how much I love gear, especially footwear. I can honestly say, I don’t remember the last time I was this excited and satisfied with my first impressions of a lightweight hiking shoe. I knew I was going to like this shoe before ordering, as it’s largely the same as the Crossover 2.0 GTX. The major difference between the two is the upper, and all of the differences are very positive in my eyes. Like all La Sportiva shoes, I purchased this model in a size 13 (47), which is a half size larger than my standard shoe size. The size 13 comes in at 12.7 oz per shoe, or 360 grams. To start, this shoe is beautiful to look at. 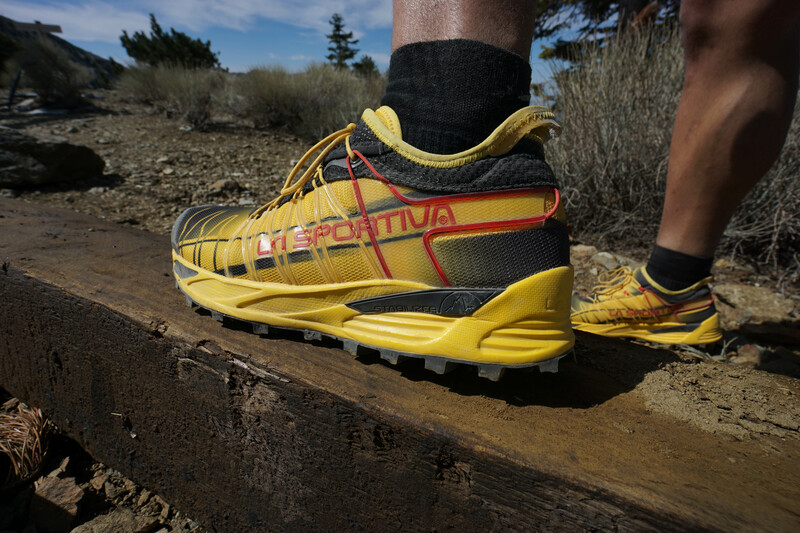 Like most La Sportiva products, this shoe just looks fast and aggressive. The black, yellow, and red work perfectly together to make for what I find to be a very attractive design. Speaking of design, this shoe gets the name Mutant for a reason, with it’s SpiralTongue bootie that wraps the foot like a sock. The SpiralTongue works in two ways. First, it gives the shoe a seamless, rub free fit, that instantly makes your foot feel “at one” with the shoe. Second, the SpiralTongue acts as a debree gaiter to keep out any dust, rocks, or pebbles. One of my favorite features of the upper is the FusionGate lacing system. There is a lace cord that is heat molded to the upper of this shoe for each section of the FusionGate to work as lace grommets. I found this to be the ideal lacing system to customize the perfect fit without having any pressure points or bunching. I also really liked the asymmetrical lace grommet on the toe. One big teller for me is that I didn’t have to adjust or tighten the laces over the 13 miles and 3500 ft first hike. The shoe felt just as comfortable on my first step as it did on my last. The upper material is a tightly woven mesh that kept my feet breathing and cool despite the very warm temperatures. Much like the SpiralToungue, the mesh kept out all dirt and debris, and my feet were as clean as they’ve been in a while after this hike. The one question I have to be answered in the coming months about the upper, is the drainability. Although the upper fabric is light and comfortable, it is also substantial. I love this for the sake of durability, but I’ll have to wait and see how it handles stream crossings. If it passes this test, it will beat out the La Sportiva Ultra Raptor to be on my feet for John Muir Trail this summer. The front of this shoe is protected by a sturdy rubber toe cap, and a solid heel counter keeps the rear end from moving around. I’ll talk more about this in the midsole section, but the stability of this shoe is superb. The final detail is the larger pull loop attached to the heel which is something I like while pulling on a shoes to keep from collapsing the heel counter prematurely. I’ll start with the midsole by covering the last. For those not familiar, the last of a shoe is the general shape in relation to a foot. The last on the Mutant fit my feet perfectly, which is why my initial opinion on this shoe is so high. Starting in the heel, the last has a secure fit, with no slip. This fit works it’s way through to the midfoot that felt perfectly dialed in due to the FusionGate. Just like the Crossover 2.0, the mutant has a Stabilizer instert that runs through the midsole of the shoe (black bar towards the heel). I found this stabilizer to work very well as I traversed uneven terrain without impacting ground feel or making my foot feel constricted. As for the feel in this section, there is a slightly raised arch, just a little more than the Raptor, but nowhere near as pronounced as the Salomon XA Pro 3D. The toebox has a great anatomical shape that allows for toe splay and comfort without any sloppiness. I experienced no rubbing or toe bumping on the descent. The cushioning of this midsole is what makes this shoe a real shining star. The injected EVA strikes the perfect balance of cushion, without being spongy or unstable. Like the Crossover 2.0, there is no forefoot rockplate or dual density EVA to protect against serious bruising, but I’ve found the single density EVA to be proficient thus far as I’ve rode the identical Crossover 2.0 midsole over some serious stuff this winter. Another great feature of this midsole that adds to the overall great stability of the Mutant is the flared heel. This is something Salomon does with their mountain running shoes as well, and I’ve found it adds a lot of balance when carrying a pack while moving fast through the mountains. The outsole tread pattern on the Mutant is the same as the Crossover 2.0, but employs the Frixion XF Green compound and not the Frixion AT Blue. In my experience, the Green is a stickier and softer compound that sticks to everything, but wears down a little quicker. The friction blue has great grip as well, but a little less than the Green. The Blue is a harder rubber compound which makes it last a little longer and makes the ride a little less bouncy underfoot. The Frixion Blue on my Crossover 2.0s have seen 5 months of constant abuse this winter and show almost no signs of wear. I know the Mutants have the softer Frixion Green, but I’m hoping they are equally durable. Enough about the compounds, the actual tread pattern is really nice for multipurpose use. The wide spaced lugs shed mud, snow, and anything else you throw at them. The lugs themselves offer a lot of surface area, much more than the Salomon Speedcross outsole, and this allows you to feel like you’re wearing approach shoes while on boulders. These shoes feel equally good soaking up the shock on a fire road or asphalt, as they do tearing down scree covered single track on a ridge line. You can tell these were probably developed and tested in the Dolomites! I hope I don’t sound too exited or too much like a La Sportiva fanboy in writing this shoe preview, but I’ve just been waiting for a shoe like this for a while and couldn’t contain my excitement. I look forward to putting these through the full test cycle over the coming months, and plan to give a throughout review once I’ve logged enough miles. As always, share and leave a comment if you’ve enjoyed this preview, and always feel free to recommend gear that makes you excited. Would you use these for a hike up Whitney? I may be going in June. They could be a good option, but it will depend on the conditions in June. I have permits for September again this year, which is almost always a dry month. June should be pretty dry with maybe a few patches of snow and ice over the last few miles. Last year I wore my Salomon XA Pro 3D, and will probably wear my La Sportiva Ultra Raptor this year. A lot of people wear boots, but a sturdy trail runner has always been my preferred footwear. I’ve had a pair for the past couple of weeks and have logged ~29 miles over 5 trail runs thru snow, ice, mud, streams, and traprock that makes New England (CT) trails an adventure in the spring. I’d say your review is pretty spot on! I’ve been a longtime La Sportiva fan (Original Raptors, then Quantums, Ultra Raptors for a brief stint, then 2 more pairs of Quantums). I agree on the sizing and the fit for the most part. I absolutely love the upper and you hit it spot on saying it locks the foot down and there’s never a need to touch the laces. However, I wouldn’t say it’s a wide toe box – it seems like a pretty standard narrow fit La Sportiva, and I did have to go 1/2 size up as expected. While I like the spiral tongue wrap, I find that I can’t get it to completely wrap around my ankle to the point that it blocks out all debris. I would need a little more material and laces higher up to get that full wrap – I’ve had snow come into the ankle area just that same as a normal shoe. As for the midsole, coming from the Quantum and a stint in Salomon Speedcross 3’s, its a little harsh to be honest – tho some of that may be contributed to transitioning from snow/ice running to dry sections and landing too hard. The Mutant does grip and climb like a dream and on uphills it just throws you forward onto your toes. Downhills, the great midsole wrap really instill confidence and I have zero movement in the shoe, which I love. As far drainability, I’ve gotten mine wet within the first mile of every run but it’s never been an issue. I do use an aftermarket insole which definitely retains more water than the thin stock one, but the upper seems to do fine when wet. Compared to the Ultra Raptor, there are less (vinyl) overlays. It was all those overlays (and heel area) which along with the heftier weight, made the Ultra Raptors a soggy mess for me when I had them. Overall, I think the Mutants a killer shoe that’s good for hiking and running and I can’t wait to put more miles on mine. Your thoughts on how these would do for ultras? I think it would really depend on the kind of terrain you’re running on. If the Ultra is on a lot of muddy soft earth, I think they would be perfect. If the course is very rock with lots of sharp objects, I’d want something with a little more protection. If you like Sportiva, you can try the Akasha. It fits just like the Mutant, but with more protections underfoot. Mmmh, seems a good option to replace my Salomons. The only issue I have is the colour, I prefer something less flashy. But, hey, whatever! Thanks for the review – I’m interested in getting these shoes to replace my completely worn out and long since discontinued Sportiva Raja’s (which I wore on a 13 day solo hike of the JMT and also on a 15 day hike of the Sierra High Route). Just an FYI (if you haven’t done the JMT before) stream crossing performance should not be a factor in choosing footwear. When I did the JMT my feet only touched water a single time – and for that I took my shoes off and just waded barefoot. Thanks for reading! Thanks for the info on the JMT as well. I’ve hiked sections before, but this will be my first complete SOBO hike. I think things will be especially dry given the drought conditions this year. After reading your review I tried these on today. The last is made for my foot. Very secure heel, snug mid foot, and bit more space in the toe box. Now that you have perhaps had some more time on them, how do you feel these hold up, especially with regards to rock protection? My biggest limiting factor right now is the soles of my feet being battered by technical trail (on Montrail Bajadas or Salomon X Ultras). After 50Km I can for sure do more, but my feet make me slow down to a shuffle as they feel so bruised. Don’t know if the Ultra Raptors would be better, but those are too wide for me. Any thoughts? The Ultra Raptors are the most cushioned in the Sportiva lineup as they have a denser EVA in the forefoot to act as a rock plate. The Mutant is not far behind though. I’ve yet to take them on any 20+ mile days yet, but should be getting a few in this month. I’ll keep you posted. Drew, I always replace the insoles in my runners with a little be thicker heel and arch support. I loved the Bushido except when I inserted my own footbed, the heel cup was too shallow and I could never get my heel to stop slipping. You state that the heel is secure. The cup profile looks similar to the Bushido. Do you have any idea how they compare or what the Mutant would be like if you added a few mm of insole thickness in the heel? I tried the Bushido and found the instep to be too narrow. The heel counter on the Mutant is a bit higher which could help with the insoles. I’ve worn Superfeet in my Raptors with no problem, but don’t need additional insoles in the Mutant. It’s tough to say without having tried it, but I’d say give the Mutants a shot. I’m doing the CT in about 3 weeks. Going to try on the Ultra Raptor, Wildcat, and Mutant. Have you decided on the Mutant for the Muir this September? Thanks. Wow, lucky you! I hope to make it out for the CT someday. I’ve actually been wearing the Ultra Raptors for my past few training hikes (my second pair) and they’ll probably be my JMT shoe. I love the Mutants, but they’re just not enough shoe for me with a pack on long days. I love them for up to 15 miles, but my feet feel a little battered the next day. Not the case in the Ultra Raptors. I put down some nice miles over the last two weeks and am confident they’ll hold up. I like the Wildcats a lot as well. More durable outsole with the Frixion Blue instead of Frixion Green. Also a higher drop at 12mm vs 8mm. Other than that, the Raptor and Wildcat are pretty similar. I don’t think you can go wrong with either. I haven’t been able to find the raptors in my size. They seem to fit very small. I wear a 12-13 depending on the brand, and even the 13.5 was too short. As of now, I’m trying out a pair of Oboz Switchbacks. They are heavier than I’d like but the fit is heaven. I was told that Oboz was started by the guy who designed the Montrail Hardrock which was my previous favorite backpacking shoe. Have a good JMT trip. I did the first half in high school (1972), and then did @190 miles in 2005 on my 50th. Had to bail at Kearsage due to a torn leg muscle. The La Sportiva lineup tends to fit small. I’m usually a 12 or 12.5 and the 13 in LS is a close fit. I’ve read some really nice things about Oboz, and just saw a post on the Switchbacks on The Big Outside blog. They seem like a great shoe. Let me know how you like them as you put some more miles down. Drew, any updates on the Mutants? I’m looking at getting a pair of these specifically to run the Spartan Race Beast at Killington Ski Mountain in Vermont in September. Wondering how you are liking these on really messy terrain over really long distances? Sorry for the delay. I’m on the John Muir Trail. I don’t have an update on the Mutant. After a few longer days on the trail, they weren’t enough shoe for me. I’m going to use them for some running when I get home, but for long rocky trails with a pack on, my feet took a little too much of a beating. They’re not quite as bombproof as the LS Raptors. On really messy terrain, the Mutants are great, I just need a little more shoe for long distances with burly trails. If the trail isn’t that rocky, these might do okay. Drew – Nice preview. Handy Andy and I tried on a pair of these in Montana and then ordered a pair for each of us. After several uses on different rock, dirt, trail, etc, I think these will be my go to shoes outside of thru hiking. In thru hiking, the aggressiveness isn’t needed. However, climbing the mountains here in Colorado, these shoes are perfect for a low class 5 and below. They grip so well to the large rocks and boulders, and they eat up the mud and roots. I think I’ve found the shoe I’ll be wearing for the next few years! Do you think they’ll continue to make this model in the future? Great post, as always. So from your comment on how beat up your feet were over 20 miles, I take it you wouldn’t recommend these for ultras, especially ones over 50K? Or am I wrong? It really would just depend on the terrain. I’ve worn these on 20 miles hikes on softer trails without issue. We have very rocky mountains here in California without any moisture most of the year. This leads to a lot of hardpack and sharp surfaces. If you were to choose between this shoe, and the new Salomon Speedcross 4, what would it be? I have not tried the new Speedcross 4 yet. I like the Mutant better than the Speedcross 3 as it fit my foot better. The Speedcross was a little too narrow in the toebox. I’ll have to try the new SC4 soon though. Got the shoes yesterday and when I tried them on I went ugh!!! The fit felt awful. But after checking out the fit and having my wife check out the fit, it was clear that I had the right size. Yet they felt skin tight (Sensatin only) and the arches felt to high. There was something I couldn’t put my finger on. So I took them out for a run and the first thing I noticed was a squish squish as my foot settled into the heel at each step. As I ran further, the shoe felt better and I actually liked the high arches. However, they still didn’t feel like they fit quite right. I have two other pairs of La Sportiva’s in the same size ( a 43.5) the fit perfectly, The Wildcat and the Synthesis Mid GTX. Is this just a break in period or should I return the shoe for a larger size? A shoe will fit everyone’s foot a little different. The Mutant fits my foot shape very well. I have 5 different La Sportiva models and wear a size 47 in all of them, so I don’t think your issue is a sizing one. as indicated I have 2 other La Sportiva’s in a 43.5 and they fit fine. If its not a sizing issue then what is it/. Could it be that the last of the shoe is just not shaped for my foot and I should simply return them and forget about them>> Do you recommend another La Sportive shoe? Hey JJB, the Mutant is more narrow through the midfoot for sure. The pronounced arch can also make it feel a bit more cramped. I’m guessing the last of the Mutant just isn’t a good fit. If you liked the Ultra Raptor, the new Akyra has a similar fit. There are also two new colorways of the tried and true Wildcat. If you’re looking for more cushion, I’ve really enjoyed the Akasha for long trail days. I own the original wildcat, a great shoe and the synthesis mid gtx, another great shoe and probably the lightest hiking shoe I have ever worn. M t wife owns the Ultra raptor and loves it. So thanks for the recommendations. I’ve never tried the Synthesis, but I’ve heard a lot of good things! For it’s weight it has good lateral.media support and it is a good waterproof shoe that doesn’t get hot and breathes well. It has handled well during hikes along and across steam beds and shallow portions of rivers I’ve crossed. Good traction to. Try it. Love the love for these shoes! After falling in love with the Salomon Speedcross 3’s only to find out the 4’s don’t fit my feet, I was a little worried I’d lost my shoe. Came across the Mutants in a little gear shop in NY, tried them on on a whim and will never look back. Aggressive, light, and oh so cozy. I will rave about the Mutants for a long time yet! I love them as well! I’m glad you found a nice option after the changes made to the Speedcross 4!